Held annually for more than 20 years, the Piano Playathon raises funds to benefit the American Family Children’s Hospital and the Child Life program. Organized by Madison Area Friends of Piano (MAFOP, see below), more than 200 performers and thousands of listeners participate in this annual event - one of Madison’s largest public piano performances. 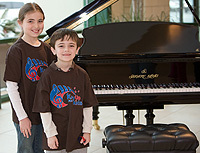 Proceeds from the Piano Playathon benefit the Child Life program at American Family Children’s Hospital. Child Life helps children cope with their hospital stay by providing play, distraction and preparation. Donations provide toys, games and supplies for many music and art activities for patients and their siblings during their stay. The 25th annual Piano Playathon will be held February 10, 2018 at Barnes & Noble, West Towne Mall, 7433 Mineral Point Rd., Madison, from 10am-6:15pm. If you are a piano student and would like to participate in the Piano Playathon, first contact your piano teacher to sign up. To raise funds for the event, use the pledge form (pdf). If you raise funds using the pledge form (pdf), please bring the completed form and any checks or cash collected to the Playathon. Checks should be made out to American Family Children's Hospital. All donations are tax deductible. Register for your studio's block of time, available in 15-minute increments, by contacting Connie Jones by e-mail at madisonareafriendsofpiano@gmail.org or phone (608) 442-8302. Encourage your students to collect pledges using the pledge form (pdf). Be sure to write your name and phone number on the pledge form before copying both sides for your students. On average, students raise twice as much money using the online personal fundraising page compared to paper forms. A prize will be awarded to the teacher whose students generate the highest donation total in pledges. Madison Area Friends of Piano is a coalition of piano dealers, teachers and tuner-technicians whose sole purpose is to promote the benefits of playing the piano. MAFOP was established in 1992 as part of national program called Study of Piano Enhances Life and Learning Successes (SPELLS). Madison is the only city to maintain the coalition. For more information visit www.madisonareafriendsofpiano.org. Madison Area Piano Teachers Associated, Inc.